Stories like this one make me chuckle. If I'd out-sourced the job of educating my children to the British state, they might make me weep. But I haven't, so they don't. The British Humanist Association has organised a protest because guidelines on the new science curriculum don't mention evolution, led by Richard Dawkins (who you should remember doesn't actually exist). Which, they claim, is a bedrock scientific concept. In fact, the centrality of evolution is a bedrock for the humanist/atheist worldview. It's the heart of reality, and explains all existence. So its absence from teaching guidelines is a bit of an embarrassment. The reality of what the scientists involved in drawing up the guidelines thought was important failed to line up with the atheist propaganda. So, being rational people, these atheist campaigners"representative scientists" presumably went to examine their beliefs about the significance of Darwinism? They considered changing their propaganda, to bring it into line with reality? Nope, they are insisting that the government changes the guidelines to bring the reality into line with the we-wish-it-were-true propaganda. A more critical/rational question though would be to ask - if evolution really is what we say it is, why do we have to keep campaigning so that those actually involved in the real science realise that it's so? Why does the reality keep having to adjust to meet our propaganda, if our propaganda actually does describe reality in the fundamental way we say it does? Mike Kendall is my parents' pastor. This is his blog. I appreciate Mike's focus in it on the main things, and sharing of short, thought-provoking items from a Biblical point of view. My wife and I listened to a sermon by MP3 last night that was very helpful. (Our church doesn't have an evening service). It was Stuart Olyott's final sermon in his 1982 series on Elisha, which you can find from his website here. Elisha's life is often remembered for its impressive miracles - it was part of one of only three "ages of miracles" in the Bible history. But Dr. Olyott showed us that there is ample evidence in the text to demonstrate that the great majority of Elijah's ministry was one of faithful, persevering plodding. The recorded events of his 58-years ministry cover no more than 20 days. But the text shows us that at the other times, he was busily getting on with simply doing the same repetitive ministry, teaching and training others, faithfully and continually. I think a little examination of people who've achieved a lot in their lives consistently shows that this is the way to do it. Plod, plod, plod. There are of course a few geniuses in the world who can master a range of things very quickly. But they are very few and far between (and their duty is then to combine that talent with the plodding to reach an even higher level of achievement). I saw this lesson again this morning at Eldoret's "nature reserve". I'd never known that termites are so tiny - and yet they can build such enormous mounds, twice the height of an adult man and more! How do they do it? Plod, plod, plod. If termites can do it, surely men must be great sinners if they can find so many ways to let years pass by without achieving anything of note. And yet the self-discipline is hard because truly we are great sinners. Growing up in the modern West the culture is to seek instant gratification. We need a thrill every minute (perhaps to keep the gnawing feelings of emptiness that come from trying to live God-less lives away?). Anything that's going to be hard and involve disciplined effort over years can't be part of this scheme (that's one reason why modern secularists dislike having children, or if they have them they want to farm them out to nannies, playschools and nurseries as soon as it's possible). But this isn't God's way. Man is meant to grow to maturity in Christ through patient perseverance. That's true whether on a large scale - consider the big-picture development of Christian history over the last 2000 years - or on the individual scale of one life. Tough lesson. But there's no other choice. You can plod forward, or stagnate before spending your last years in bitter regret because now you can't achieve what you could have done in the wasted years of strength. The memorable and dramatic days of life may come - 20 days worthy of being recorded in 58 years, in Elijah's case. But for the rest, God has set us a work, and our job is to do it. If we can trust him for the big and momentous - why not for this too? The storm-in-a-tea-cup in which the president of the USA criticised and then apologised for criticising a particular police department is a good illustration of the fall of the modern West. This isn't a remark about President Obama personally; his "apology" is simply a good specimen of the corruption of modern manners. As society progressively does its best to abolish the idea of sin, trailing along with that the idea of taking responsibility for sin goes the same way. Now, to anyone in the world who's still sane, the President obviously did directly "[malign] the Cambridge police department". He called them stupid. If the word "malign" has any meaning at all, he maligned them, and that was precisely the intention when he opened his mouth to speak. But note now the very modern apology. He didn't actually malign them; rather, he gave that impression. Not a reality, note! Or rather, he thinks he gave an impression - there's still some room for doubt, if you've got time to do a thorough investigation. It's regrettable if you picked up that intention from his words. This is original sin and human pride in action. To say "sorry, I maligned them and it was wrong" is just 8 words, that costs not one dime to say and only about 2 seconds of your time (much less than the long-winded, convoluted alternative). What it does cost, is a little loss of personal pride, a price which we all find a lot harder to pay. There's a tension between the fuss caused by having done something wrong, and this price - so instead, he tries to pass us a counterfeit instead; de-weaselising the code, he said "you misread me in thinking I said something regrettable, which ultimately is your mistake as much as mine, so we're about evens". Original sin in action: a man with the gifts, intelligence and drive to rise to the highest office in the world yet has not enough control over his own ego to admit to having been wrong about something totally and utterly trivial. Again, this isn't about President Obama - he's hardly the first or the last politician to promise "change" and "a new politics", blah blah, but it's also useful to note how quickly such promises turn into the "same old, same old". Original sin is real, and can't be abolished simply with good intentions, charisma, education, better politics, etcetera. The world needs one thing and one thing only - to acknowledge that Jesus Christ is Lord, and to bow to him. Let me repeat again - it's not about Barack Obama. What he did is totally common-place. It happens so often that we don't even notice it. And that again is a proof that original sin is exactly what the Bible says it is - rampant, everywhere. That's why we need such a solution as the Son of God dying for us - everything else, however good it sounds, doesn't actually deal with the problem. If a world leader can't even say "yup, I was wrong, let's not make excuses", what does that say about the condition of man? Throughout Kenya and in some circles in the West, faith is often thought to look something like this. I'm trusting God for ... (fill in the blank). I'm trusting God for the 3000 shillings I need for school fees. We're trusting God for 10 visitors to our service next week. We're trusting God for 5 converts from our mission. We're trusting God for a new job by next Tuesday. Etcetera. My old university just sent a prayer letter; one college is praying to God for 10 new students in the next year group. That's not faith, that's presumption. Faith trusts God for what God has promised in his Word. The Bible doesn't say that he'll bring you any of the things above, so you can't trust him for it. You can ask him for it, subject to his will, and in submission that he might have a totally different plan. Why ten students? Why not nine? Or eleven? Or two hundred and fifty six? But in most cases, it would be better simply to ask him for as much or as many as he sees is wise, and for grace and wisdom from him to know what to do if not. Faith means trusting God's actual promises in all circumstances, whether he sends us what we think is best or not. Jesus died and rose again. The only way to keep going in the Christian life is to keep preaching this gospel to yourself. The work God has given us is absolutely impossible. But he is the God of the impossible; Jesus died and rose again. He's the God who brings life from death. So the impossible is not only possible, but the very heart of what we are and what we do. Without it Christianity wouldn't be what it is. Many challenges. Many road-blocks. Many stumblings. Here in Kenya the work of planting credible, Bible-based, loving, fellowshipping, Christ-centred, evangelistic, holy churches seems to have hardly begun. There are "churches" and "Christians" everywhere; but the "Christianity" is little more than lots loud noise, excitement and wide-scale heresy (mostly of the "health and wealth" kind). Protestant Christianity has been here for 140 years - but the culture at large has hardly been touched: corruption, theft, lying, cheating and fornicating are the norm everywhere you turn. It seems hopeless. But in fact our God is the God of the hopeless. He brings life from the dead. Jesus died and rose again. Glory and resurrection come following death. I think it's John Calvin who described the work of a minister as being a "living death". When I was a boy, it looked a terrible work to me and I had no desire to go near it. Later, God changed my thinking. It's a glorious work, as well as a terrible one! But the terrible side is all temporary, and the glory is forever. Jesus died and rose again - never to die any more. When the great day of testing and judgment comes, the empty riches of this world will be burnt up as useless stubble. The work of Jesus will remain. I found John Piper's comments about difficulty in the work of the gospel here encouraging. Some, nay many, of the advocates of the "Federal Vision" are clever, winsome and articulate. They point out many of our weaknesses in modern evangelicalism very effectively. They have excellent family lives, and a full-orbed view of Christianity and the impact it should have on the world. For all this I praise God. But I continue to be a resolute opponent of the "FV" because despite all of this, I believe its fundamental doctrines and the outworking of them are profoundly and dangerously contrary to Scriptural truth. One of the most important theologians who has been a huge influence in promoting FV theology is James (Jim) B. Jordan, 60 years old this year, presently of Florida, whose ministry is called "Biblical Horizons". He's basically theologian numero uno in the FV movement, so it's important to know what he thinks and believes. It's common to find in the books of those in FV circles a credit to the influence of of Jordan in the front of the book or wherever. David Field, the/a source/channel of most FV teaching in the UK, writes "Jim Jordan has been, without a shred of doubt, the most important influence on my theological thinking over the last 20 years." (http://davidpfield.blogspot.com/2007/09/jim-jordan.html - recently taken down with the rest of his blog, but still available in the Google cache). In another post, he offers to refund theological students or past students of the particular theological college where he was teaching (from which most of the FV advocates in Christian Ministry in the UK have come) $75 if they buy Jordan's collection of MP3 lectures and listen to 20 of them and decide they wanted a refund, saying that he would "retire happy" if a good number of the students of that college would listen to them. So you can see that Jordan's an important figure in the FV. I find Jordan's writings routinely stimulating, often insightful, and sometimes correct. But I'm rambling. The point of this post is to point out just where you're going to be led by Jordan if you appoint him as your guide. This will also be helpful for those who don't know what the FV is, or why I would speak so strongly against it, or who think perhaps the difference between the FV and the Reformed faith as we know and love it isn't that significant. Dr. Jordan would like to tell you why, because he thinks the difference is very significant. Read his latest output to see where he's coming from / where he's going. Dr. Jordan refers to the mainstream Reformed movement as "Gnostics", calls them "Calvinists" only in quote-marks , says that they have distorted the confessions and catechisms "almost beyond recognition", says that modern evangelical Presbyterianism is basically the same as medieval Roman Catholicism, that communion held in Reformed churches is effectively the same as the medieval mass (on the grounds that many churches uses alcohol-free grape juice), that Reformed opponents of the FV have "no interest in the Bible", "identically" with medieval Rome, and so on. The Bible is not a systematic textbook; but it does, in its various scattered statements, reveal a comprehensive and consistent system of doctrine. Moreover, it insists that that system of doctrine should be known by all - it should be believed and taught throughout the world. Just because it is not explicitly systematised in the Bible does not mean its significance is in any way reduced (e.g. Jude 1:3, Titus 1:13, 2 Timothy 2:2, 4:7). Where was that quote in Scripture? It's in Exodus chapter 3, at the burning bush. Who wrote it? Moses did. Who, according to Jesus, did he write it to? To you, who are alive today and whose beliefs and lives today are intended to be regulated by it. In the ancient Scripture, God today tells you what to believe and then how to live. That's Jesus' doctrine of the Scriptures. It's not a dead piece of history, but a living word, addressed to all people of all times - and which will one day judge us. I'm tired today. I've had a heavy cold lately and was at the Bible college yesterday which is a long day. Being tired makes getting stuff done a challenge. Will power decreases! The amount of time we waste is a great proof of the truth of original sin. Is anything accomplished by wasting time? By definition, no. Are we glad afterwards? No. Do we want to never do it again? Yes. Whole books are written on the subject. Yet do we keep on doing it? Yes! I've benefited from reading various peoples' tips on their blogs (probably whilst wasting time when I should have been doing something else...) over the years, so here's one of mine that helps me through the very tired days (when the schedule isn't fixed already, that is - when the pressure of already fixed events and what needs to be done right now doesn't dictate the day already). I write down a list of everything that needs to be done, then set a timer (on my phone, or you can use a stop-watch, alarm clock, etc. ), and spend about 25 or more minutes on one thing before moving onto the next. (The length of time depends on how tired I am - the more tired, the less time on each thing before concentration gets a big struggle). Today I've been alternating - choose something hard, then something easy. If I don't include that rule, I'll just do the easy stuff - but it's a rule of life that most of the time the hard stuff is what really accomplishes something worthwhile. There's so much easy stuff that I could spend all day processing the lists of that - but that's only slightly better than wasting the day in terms of accomplishing the long term goals. In between 25-minute slots, make a cup of tea, pray, or tidy something - then do something else. Works for me. If I just write a list, or if I just start doing some stuff that needs doing with no list at all, on tired days I normally end up drifting, aimless, wasting time. As I say, works for me and helps me to redeem the time a little better. Hope it helps someone else out there too! On the resources page of my website I've just added (with permission) an 8-page summary of the teaching of the book of Exodus, written by Martin Bussey (a Bible college lecturer in Africa) using Vern Polythress's "The Shadow of Christ in the Law of Moses". Here. Romans chapter 11 : Is God through with the Jews? I am presently teaching the book of Romans at a Bible college in the Rift Valley in Kenya. This is the fifth time I've taught the book of Romans. What an incredible book! What great good news. Paul's day: Jews hardened. Salvation comes to Gentiles. From Paul's day until the end of the present age: Salvation continues to come to the Gentiles. Right at the end of the present age: A huge awakening amongst the Jews, which then brings immense blessing to the whole world. This view, then, looks at verse 12, "Now if their fall is riches for the world, and their failure riches for the Gentiles, how much more their fulness", and takes "their fulness" to mean "their recovery through a great final awakening." Paul's day: Jews hardened. Salvation comes to Gentiles. A remnant of chosen Jews are stirred up to jealousy, and come to faith, bringing immense blessing to the world (Paul being one such). From Paul's day until the end of the present age: A remnant of chosen Jews are stirred up to jealousy, and come to faith, bringing immense blessing to the world. Right at the end of the present age: This question is not directly addressed by Romans 11, and different ideas can be harmonised with it. This view looks at verse 12 and takes "their fall" to be referring to the the unbelief of the majority of the nation, and "their fulness" to be the saved remnant of believing Jews such as Paul and other Jewish converts, in his day and since (pointing to verses 13 and 14, and Paul's desire to accomplish precisely this, rather than referring to something many centuries away). My reasons for changing their mind have as much to do with harmonising Romans 11 with the rest of Scripture as with the study of Romans 11 itself. I think that both views can have a very plausible prima facie case made from Romans 11, though I think ultimately the second view has the stronger case both within and without. I tried to explain a little here as to why I think the context in Romans 9-11 as a whole leads to this conclusion. The expositions I've read of the "end-time historical event" view contradict what Paul has said about the identity of the authentic, God-favoured Israel in chapter 9. They end up saying that ethnic Israel really is special after all and that's why God will send a great awakening amongst them at last, after Paul's laboured the point again and again (as in the rest of the New Testament) to explain the precise opposite.
" ... hardening in part has happened to Israel until the fullness of the Gentiles has come in." Paul's day: Majority unbelieving, remnant saved. Since then until the end: The "times of the Gentiles", gospel advances amongst nations, whilst Jews mostly remain hardened in unbelief. When the fulness of the Gentiles has come in, then there's a great Jewish awakening. Then this brings brings even greater blessing to the Gentiles and "riches for the world", verse 12. Their fall brought riches - how much more their restoration! The awakening spreads from Jews to the nations. But that's incoherent. The "fulness" of the Gentiles comes in, but later, there's a vast awakening bringing unprecedented blessing to the Gentiles. Which means that their fulness in fact hadn't come in, because what happens afterwards is greater than what came before. It doesn't scan. The view that Paul is describing an ongoing process which continues until the end doesn't face this difficulty. Some teachers answer this objection by saying that the greater blessing which comes to the world is the resurrection - the return of Christ is then immediately ushered in. They say that this is in verse 15 - "life from the dead". In other words, "life from the dead" is a code phrase, referring to the resurrection. But verse 15 begins with the word "for"; it explains verse 14. In other words, it's something that Paul himself hoped to achieve through seeing Jews saved in his own day. Moreover, there is nowhere else in Scripture where Paul uses a "code phrase" for the resurrection, or this phrase in particular. This seems to be using something dark and hidden as the key to control the interpretation of the whole passage, which isn't the right way to do Bible interpretation. Paul never mentions the resurrection elsewhere in the passage. And again, in particular, from verse 12, it is riches "for the Gentiles" that Paul anticipates - it is the Gentiles who receive this "life from the dead". But the resurrection is an event for both Jews and Gentiles, not Gentiles specifically. To my mind these ad hoc modifications which have to be brought in to save the scheme after you've observed the fundamental contradiction in it, are harder to swallow than the alternative interpretation. As I've already said, I think the alternative interpretation dovetails much more closely with what is outside Romans 11. Hence I don't believe that this historical sequence of a last-days Jewish revival is taught in Scripture. In common with all of orthodox Christianity, I affirm that the Lord Jesus Christ will return in glory, visibly and bodily, to judge the world at the end of the present age. Some of my brethren, though, go a lot further than this, and teach that the "signs of the times" show that that coming is practically upon us now - in other words, that the approximately 2000 years of the church age is basically much the running of the church age from its beginning to its end. That teaching, though (that the coming is probably/certainly in our generation), has been around for quite a long time. Several generations in fact! It's always had its adherents at different times since Christ first went into heaven. But it has especially flourished and become quite mainstream in Western Christendom, and then been exported from there to the world in the missionary movement, since the 1830s. Which is more than one generation away. (It gained a good hold from that time because of firstly the decline of Reformational Christianity, and because of the rise of liberalism eroding "Christendom", which was too closely identified with God's kingdom in the world). The problem, in my opinion, though is that the very traits which lead people into readily accepting this idea also manifest themselves to insulate them against questioning it. Most moderns are fantastically ignorant of history, so don't know that this doctrine has been around so long. We think that the decade we draw breath in is uniquely significant above all others. In the same way, we think that the part of the world we live in is uniquely significant above all others. The collapse of Western civilisation becomes the collapse of the world, because the West - well, if it's not the world, then it's as good as. The rest's just a tin-pot junkyard of darkness and insignificance! Ha! Well, no. That's not in the Bible either. The British and/or Americans really aren't the lost 10 tribes of Israel or something equally eccentric. Not even the Royal Family. The West may have led world Christianity for a long time, but whether it does or not in the future has no theological significance. Today, the light is dawning in many parts of the world in a way that it never has before. Those parts of the world may not be on your televisions or in your newspapers; the kingdom doesn't work that way. The "it's the final rebellion against the rule of Christ!" teaching doesn't provide such a neat fit if you live where the initial, preliminary dawning of the light of Christ is still taking place. Christ is still being preached in places where he hadn't as yet been scarcely named. The West may be jumping off a cliff; large parts of the rest of the world though are still in the darkness the West was in before it ever received the blessings of the gospel. "The end is nigh" teaching is a manifestation of the unfortunate tendency of Christians to remain shackled by their cultural assumptions instead of developing a truly Biblical view of the world. I've been using a certain commentary on Exodus with my Bible college students this term. It's OK; I don't think any commentary I know of really suits their needs, but we're doing the best we can. I keep reading things like this "Just as the children of Israel .... so we also". Just as they did this, so we do that. Just as God did this with them, so he now does this to us through Jesus. Well, yes. But at least some times, I'd be glad if the author spelt out that the relationship between "them" and "us" was more than just correspondence - more than a handy similarity of appearance and form useful for illustration Christian principles with. The link is vastly deeper than that. The Exodus is a type of the gospel, planned in great detail. We are a covenanted people, redeemed by blood and living under the rule of our Saviour-King, travelling towards the promised inheritance. Jesus was active at the Exodus, teaching people about himself and filling out more of the content of the promises he'd given before that time. Redemption is progressing, as God had planned. As Oliver Cromwell cried out on his death-bed, "the two covenants are one!" Do we evangelicals today really have this grasp of history, as one coherent story moving forward perfectly as planned? Is the Old Testament just a book of neat illustrations for Christian doctrine, or is the multi-faceted jewel of the gospel being shown to us from all kinds of angels, and the growing people of God developing from infancy to their full maturity in Christ? 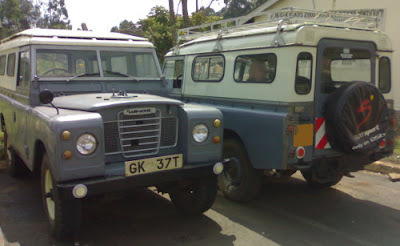 A few times around Eldoret we've spotted our car's twin - same make and model from the same era, same colour scheme (resulting from its history as a pick-up later converted for passenger use). But yesterday we managed to park right next to it! It's a beauty, or at least it is if you think 1970s Land Rovers are objects of beauty. I do, as long as it doesn't break down. Otherwise it's an "ARGH! JOLLY USELESS PIECE OF OLD JUNK! GAH!". Up until the point it gets fixed and I learn something new about the internals of cars which makes it all seem so simple, then we're friends again. Ours had a thorough overhaul a couple of months ago and has run smoothly since (apart from when the fuel pipe started leaking - again (again (again))). I heard about the famous "Hummer", the gas-guzzling monster from GM. A quick few calculations show that... moving to a Hummer would improve our fuel economy (8mpg - count 'em! Though since the overhaul it looks like we're getting 20% more). In the new green religion, does this make us eco-heretics, or does keeping an old car on the road rather than junking it and spending all the resources on building and shipping new ones make one an eco-hero? Our church in Eldoret recently, for the first time in its life had to go through the sad process of putting out a member whose life was consistently and repeatedly inconsistent with the profession of faith in a holy God. There had to be many meetings before we made the painful decision that the one whom we had called "brother" did not have credible evidence of repentance in his life. When I lived in Oxford the church I was in put out two members, and two later returned - one of them about 2 years later, the other a little sooner. It greatly increased my confidence that the painful way laid down in the Bible is the best way, difficult though church discipline is in the present "thou shalt not offend anyone" culture of the West.